Today we present part 2 of The G's discussion with SF/F super-critic Paul Kincaid. If you haven't read Part 1 yet, you can access it here. With regards the “crisis of passion,” I want to refer to some things you said in a recent interview you conducted with Jonathan Strahan and Gary K. Wolfe. Specifically, that writers don’t appear convinced by what they’re doing—“working on a treadmill,” to use your words; that they’ve lost the conviction that the future is understandable; and that many writers are, essentially, producing stories that look like science fiction, rather than stories that are science fiction. In that podcast, Gary made a point that it is still easier to get a science fiction or fantasy story published than it is any other form of short fiction. I’m not sure I fully agree with Gary, but I do think that the market is part of the picture. In his version there are all these writers out there who are, in effect, performing science fiction as a way into print. They are investing in a set of second-hand tropes and pulling on the gaudy disguise of science fiction in order to act out the part of being a genre writer. In truth, it’s certainly much more complicated and subtle than that, it always is. But I still get a sense of an awful lot of writers acting out science fiction rather than being fully committed to engaging with the genre. Now as I’ve said a number of times already, I am not taking a judgmental stance on this, the performance of SF may not always or necessarily be a bad thing. We always used to say that science fiction was a conversation, that writer B would pick up on an effect or an idea from the work of writer A, then watch as writer C took it another stage further. In a sense, this is a performance of science fiction, and it is part of how the genre (any genre) has always worked. Or you might have a writer who wants to pay homage to, or possibly recreate, works of science fiction that inspired her. These are ways of performing SF that are perhaps good, at least neutral. But there are other stories in which the SF devices are painted on to a paper-thin screen with nothing behind them. We’ve got a rocket ship. What is the rocket ship doing? What is it like to live in a world that has such a rocket ship? I don’t know and I don’t care, but, hey, we’ve got a rocket ship so it must be SF. That is obviously exaggerated for effect, but that is what I mean when I talk about stories that look like SF rather than being SF. And there are a lot of them about. Most commonly, such stories just feel flimsy, they feel as though there is no genuine intellectual substance behind them. Or you get the stories in which every genre trope in the book is shoveled in, as if the more bits of SF business you squeeze into the story the more science fictional it is. 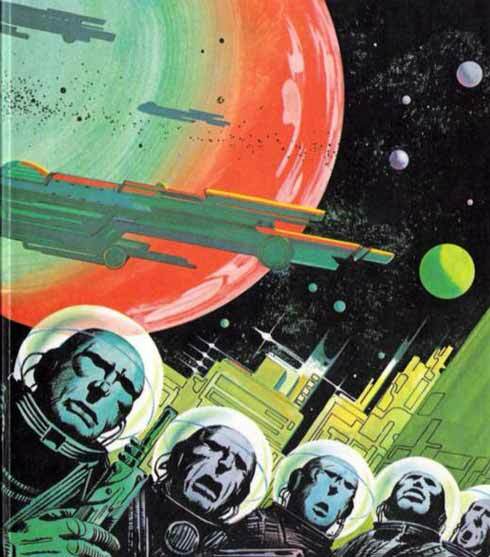 There were some stories I read, in those collections and in others, where I just felt blitzed by an incoherent flood of SF images that could never actually be worked through in a way that made sense. Everything is in the imagery, on the surface of the story, with nothing underneath. The example I picked on in the review was ‘The Copenhagen Interpretation’ by Paul Cornell, though it was far from being the only example. One of the reasons I picked on the Cornell was that it had already won the BSFA Short Fiction Award, and I wonder whether this knowingness in the use of familiar SF imagery isn’t flattering to the SF reader. I know you recognize all these clever quirks and games, because we’re all friends together here in our little world. There is, certainly, a growing tendency to write SF stories about SF, and they are clearly appreciated by the fans. Among Others by Jo Walton, which won the Hugo Award, is only the most recent example. Now I don’t dislike Among Others, it is well written and there are some aspects of it that I rate very highly indeed (though it is one of those novels that has tended to diminish in retrospect). I was particularly struck by her ideas about magic, which are a development of the ideas explored in her much better novel, Lifelode. But what has earned most attention, and what probably tipped the balance in the Hugo voting, was what I found the most tedious aspect of the book, all that stuff about reading science fiction at an early age. There were, in fact, remarkably few life lessons learned from those SF novels she so carefully enumerates, they do not shape the novel; what they do do is wink broadly at the SF fan reader, we’ve been there, read that, it makes us special together, fans are slans. That is SF as performance, SF as protective colouration; it is not SF as an engagement with or exploration of the world, in the way that the magic in Among Others attempts to be. You pose an interesting question to Strahan and Wolfe: “is there any other genre that finds so many ways to pat itself on the back?” Why do you think that is, and how does it affect both the products and audience for science fiction and fantasy? How do these “best of” anthologies play into this? To be honest, I don’t know the answer to the question I posed. I know there are a handful of awards in the crime fiction genre, though I am not aware of any best of the year anthologies. Similarly, there are a few awards for romance fiction, though again I don’t know of any best of the year anthologies. There are more awards in mainstream fiction, possibly as many awards as there are in SF, but year’s best anthologies are sporadic and I think the one regular series that I followed died a good few years ago. If we take the three central forms of the fantastic, science fiction, fantasy and horror, there are god knows how many awards, and a few years ago I tried to count up how many year’s best anthologies there were and lost count. Why that might be, I really don’t know, though I can hazard a few guesses. Possibly, given the size of a genre where we can no longer keep track of the edges, as I proposed a little earlier, it may be that the awards and best of the year collections are a way of keeping track of the genre. But the size issue must affect other genres as well, so that couldn’t be anything more than a partial answer. Of course, going back to what Gary Wolfe was saying, the fantastic seems to produce many more short stories than any other genre. That may be part of it. The nature of fandom probably plays a large part in this, also. After all, most of the awards, at least, have emerged out of fandom and many are still primarily popular vote awards. And whatever else we might imagine, I suspect that the best of the year anthologies are also aimed far more at fans than they are at a more general audience. The reason is probably a mixture of all of these, and several other reasons I haven’t thought of. Though I do strongly suspect that one underlying reason is ghetto mentality, inferiority complex, whatever it is that makes SF fans so susceptible to ‘fans are slans’-type flattery. I realized, when we were talking about it on the podcast, that the explosion in best of the year anthologies, both in terms of their size and their number, came at a time when we might popularly suppose that the ghetto walls had been broken down. From one direction there came the mass popularity of Star Wars, from the other the fact that Thomas Pynchon was shortlisted for a Nebula Award. It was a period when you’d expect SF to be feeling pretty good about itself, but maybe a security blanket had been removed and there was, in a sense, even more reason for us to tell ourselves that we were not only good but distinctive. I don’t know, but I have a feeling that the timing cannot be entirely coincidental. What’s the effect of all this? Almost certainly there has been a slow but steady homogenization. There are certain writers (Lois McMaster Bujold) who are seen as archetypal Hugo winners, though they don’t exactly sweep the other awards. There are writers who are seen as naturals for the Clarke Award. One of the reasons for the controversy over this year’s Clarke Award was that so many of the books that might be seen as a natural fit for that award had been omitted from the shortlist. There are writers who keep cropping up in best of the year anthologies. I remember noting, in one review, how many times the author of each story had appeared in that particular editor’s previous annual collections, and it was surprising how much regularity there was. And yet, as I said before, the field is now far too big for us to see the edges. It is a problem, especially when you have critics like me pontificating about the state of SF even though none of us can see the whole of SF. (I console myself that those who attack my views cannot know the whole of SF either.) What we do, all that we can do, is look out for things that catch the eye, that emerge out of the morass. That’s where awards and best of the year volumes come in. These are, through whatever arcane processes, things that have caught the eye, and though they may not be best they are at least representative. They tell us about how different constituencies view the genre at that moment. They demand state-of-the-nation responses, because that’s exactly what they are. They offer, at best, very partial glimpses of the state of the nation, but it is all we have. So if half a dozen steampunk stories make it into best of the year anthologies, then we see steampunk as the coming thing. If a space opera wins one of the big awards, then we see space opera as the current trend. And authors are only human, they follow trends like the rest of us. So it can be hard to tell if we are seeing a genuine trend or a self-fulfilling prophecy. So you get the impression that awards and best of the year anthologies are our searchlight into the depths of the genre, while at the same time they are muddying the waters. And yet all that they are really saying is: aren’t we good, aren’t we special, we’ve got so much that is award-worthy, so much that is ‘best’, so much to congratulate ourselves for. Isn’t this “crisis of passion,” in some ways, a typical problem faced by the arts when expectations become institutionalized, and when institutions themselves—publishers, magazines, awards, even anthologies—become—to paraphrase some sociologist or another—regular, periodic, predictable and self-replicating? Reading your article, it occurred to me that perhaps the surprising thing is that science fiction and fantasy only just reached this kind of institutional malaise in the last 10-15 years. I’ve seen it happen much more quickly with certain forms of popular music, for example. One of the responses to my essay that I’ve seen in several places is: just another prediction of the imminent death of science fiction. Actually, I anticipated that more people would respond that way. It’s a rather simplistic reading of what I was saying, but in fact talking about the exhaustion of the genre is nothing to do with predicting its death. I think you are right, this ‘crisis of passion’, as you put it, is by no means unusual to science fiction. I suspect most if not all art forms go through it on a fairly regular basis. I picked up the notion of exhaustion from a famous essay that John Barth wrote about American mainstream fiction in the 1960s. Barth wasn’t talking about the death of fiction, and indeed American mainstream fiction has quite obviously not died. What he was saying, however, was that it was entering a moribund state and needed to reinvent itself, to find a new purpose, a new mode of expression, a new energy, if it was to continue to have any relevance. It was a polemical call to arms, primarily intended to advance postmodern fiction as the savior of literature. Well okay, I feel that science fiction is approaching such a state and needs to find some new purpose or energy in its turn if it is to continue to have any relevance. My essay was also intended as a polemical call to arms, though without trying to espouse any particular form of salvation. If such exhaustion is not unusual to science fiction, nor is it original. We’ve gone through such states before. Science fiction, particularly in Britain, was moribund in the late-50s, early-60s, and the New Wave that Michael Moorcock propounded through his editorials in New Worlds was one form of revitalization. Similarly, both cyberpunk (particularly as articulated through Bruce Sterling’s polemical writings) and the British Renaissance were revitalizing movements in a genre that was largely running on the spot. You also state that these problems are rather more pronounced in short fiction, as opposed to with novels. Why do you think this is? What’s specifically the matter with short fiction? From time to time, as I’ve been answering your questions, I’ve found myself tempted to offer an evolutionary model of science fiction. I’ve tried to resist it, partly because it is too easy an analogy, and partly because it works in broad terms but rarely in specifics. But here, perhaps, such an analogy might work. There is less competition within short fiction, stories don’t really have to fight for their place in the food chain. In other words, short genre stories are mostly going to appear in genre venues aimed almost exclusively at a genre audience. If you are writing for an audience (and which author trying to make a living in this business is going to ignore the audience?) then it is going to pay to meet genre expectations rather than challenge them. That wasn’t always the case. Up until probably the 1970s, short fiction was generally the engine of innovation within the genre. New writers announced themselves, acquired a following, through writing short stories, and they tended to do this, to catch attention, by offering something different. Since few genre writers began their careers by writing novels, the distinctive and innovative work developed in the short fiction would then be carried through into the long fiction. Now it is the other way round. More writers begin their careers with novels than with short stories, so it is the novel that carries the weight of offering eye-catching innovation. Short fiction comes later, and often seems to be more about establishing or consolidating genre credentials. And if that is the prime concern, then a conservative approach to genre would be more rewarding than a challenging or innovative approach. By conservative here I do not mean to suggest that all SF stories are the same, that all are as uncontentious and unambitious as an average piece from Analog. The avant garde can be conservative if all the stories contending to get into the leading avant garde publication are expected to be put together from the same narrow catalogue of tropes and tricks. By conservative I simply mean that stories are more likely to get into a particular venue if they are like the stories that have already appeared in that venue. And as long as the genre short fiction marketplace is so vast that there is liable to be some venue for the great majority of the stories written, and yet all of this marketplace is contending for the attention and the money of a shrinking audience, then there is unlikely to be much of a premium on going against the norm. If you were to assume the mantle of “science fiction doctor” for a minute, one who has made his diagnosis of “exhaustion,” what if any sort of therapy would you prescribe? What’s fixable in science fiction and fantasy, and specifically in the realm of short fiction? What needs to change and what can change? Good grief, that’s a job I’d hate to have. As I’ve said, I see my job as descriptive rather than prescriptive. I don’t want to remake science fiction in my image, just as I don’t want science fiction to be remade in anybody else’s image. I like it being variable, hard to pin down. No, I’ve said that I find science fiction is going through one of its phases of being inward looking, repeating itself rather than reinventing itself. I find that to be unchallenging, uninvolving, and ultimately uninteresting. That is my diagnosis. But I don’t want people to take my word for it, I want them to go out and get a second, third, fourth opinion. More importantly, I want them to form an opinion of their own. If enough people find they agree, then I expect the genre will change naturally. It will probably change anyway, it always does. How it changes, what direction it goes in, whether it finds a new life or slithers away to some sort of beach at the end of time, like in The Time Machine – well, that is the question. There are some things I’d like to see, of course. I’d like to see a best of the year anthology that genuinely did what the title claims, that was short and sharp and contained only stories that one guiding and informed taste thought truly were the best. I’d like to see us collectively praising the different rather than the familiar. But whether that would make any difference, I don’t know. And whether anyone else would agree, that I don’t know either. Going in a positive direction for a minute, what writers and trends in the genre give you hope for the future? Have you read anything recently that you feel our readers should know about? In short fiction, I’m currently reading Angels and You Dogs by Kathleen Ann Goonan, which is as interesting and challenging in its way as Maureen McHugh’s After the Apocalypse was last year. I also have Kij Johnson’s collection, At the Mouth of the River of Bees, and at her best she can be very good indeed. And it is very rare for me to read anything by Karen Joy Fowler or Kit Reed that I don’t enjoy. So there are quite a number of interesting short story writers out there who are well worth looking out for. At novel length, Empty Space by M. John Harrison is simply the best novel of the year so far; last year, The Islanders by Christopher Priest was supreme, and I’ve had a sneak preview of his next novel, The Adjacent, due next year, which is astonishing. Adam Roberts has been writing novels that I don’t always get along with, but his most recent one, Jack Glass, is, I think, excellent. Actually, given what I said earlier, I think there is more challenging and impressive work being done at novel length than in short fiction these days. One of the things I’m finding most interesting, however, is that we are starting to see work that doesn’t come from a straight Anglophone tradition. Whether the writers are working in English, like Aliette de Bodard or Lavie Tidhar, or whether we are seeing translations, like Johanna Sinisalo, it is refreshing. (I should note that the Tiptree Award, among the many other good things it does, has a fine record of picking non-Anglophone winners.) Whether it might shake up the genre, I don’t know; but I’d like to see more of it. Thanks for coming and speaking to me about these things. I hope it’s been a good experience! Final question: do you have any projects that you’d like our readers to know about? Well, I saw the essay for the LA Review of Books as a work in progress, so I am hoping to get the opportunity to write more in that vein. Also, I have a second collection of reviews, Call and Response, which should be coming out, I hope, in 2013.